We know. It is a bit early for Christmas. We apologize. 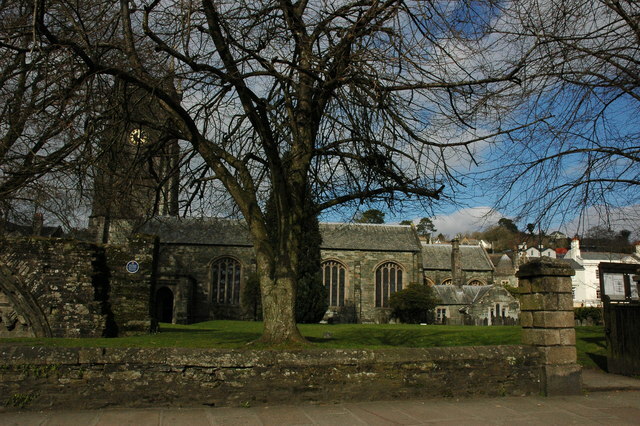 However, the reason we are rushing the season is to mention an upcoming event Muffin Dog Press will participate in: The Christmas Tree Festival at St. Eustachius Church, Tavistock, Devon. Muffin Dog Press Cyber-Guru Simon Tiley grew up in Tavistock, and spent years acting as acolyte, server and crucifer. But no, that won’t have anything to do with the tree. Our theme is A Book, a Biscuit, and a Cup of Tea. Toddle along to St. Eustachius and see our efforts, and the efforts of a couple dozen others, between 28 November and 7 December. Here ‘s a photo of the ancient beautiful church,right in the middle of an historic markettown–well worth a look. An excerpt from Laura Harrison McBride’s mystery novel, Car Full of Death: A quirky British Mystery Romp. tanking, which means you can always get more shekels out of punters for booze. The U.S. economy speeds toward a brick wall. But instead of trying to stop or even slow the fiscal train wreck, many senior citizens want to push hard on the accelerator. Adding insult to injury, that generation decided they didn’t want to be called old people; they wanted to be senior citizens. By inference, then, everyone else is a junior citizen. Few people like to spend their lives being “junior” in anything, especially if they have worked and struggled like everyone else on the planet. It would be news to the WWII Generation, not long on making the fine distinction between honesty and appearance, but accolades cannot be demanded; they can only be deserved. Whenever a person claims greatness for herself, isn’t there a justified hint of suspicion that they are, in fact, not the greatest? Muhammad Ali claimed to be the greatest, though, and he really was in the single thing he claimed to be the greatest in. Perhaps that’s what confused people on that issue. But it needn’t have. He knew himself, and realized not only that he had the talent, but also the will to be great. In the case of the Greatest Generation, they have simply appropriated a title that is too broad, in fact, to be meaningful, but makes them feel good while, by contrast and inference, making everyone else feel bad. It is bogus a priori. They did not achieve it, but were granted it by someone who was busy plowing his own field of fame and fortune and, if truth be told, might be considered to have used that generation as fodder for his own mill. Does Brokaw think the Founding Fathers are chopped liver? Does Brokaw really believe they are the single greatest generation in history? If he does, he didn’t even deserve to be a talking head, being ignorant of the American generation that wrote a new political book for mankind, the Founding Fathers. Being ignorant of the artist/scientists of Venice during the Renaissance who opened up the universe for us, often at the cost of their lives. In fact, there is no single greatest generation in history, American or other. · Whatever your opinion of the reasons for the Vietnam War, its management was execrable. Why, since Boomers were young adults or children at the time is the Boomer generation blamed for it? The decision makers, who are properly to blame, were the World War II generation. · Who was in charge during the 1970s when stagflation was destroying jobs and lives, and during the next decade? Not the Boomers. · Who presided over the sudden deification of the old over the young during the 1960s and 1970s, leading to the giant expenditures for and shortfalls in “entitlement programs” such as Social Security? It is difficult to credit how a generation that truly was the greatest at anything could be so completely responsible for the despicable juggernauts above. Clearly, they can’t claim greatness based on these blunders. But what about the war itself, the war that helped Brokaw create the undeserved cache? Were they the greatest then? · How difficult a task was it to win WWII? With Japan failing miserably in its desperate gamble at Pearl Harbor and the German offensive grinding to a halt in Russia, was there any way that we could have failed to win the war or wasn’t this merely a mopping up operation, however costly? · Did this generation’s responsibilities cease on V-J Day? Besides the question of the Soviet Union, where was this generation during the Cold War, Korea, Vietnam, etc? Were they responsible for these failures or merely unsupportive of our soldiers during them? · Do the difficulties of the Depression and service in WWII really justify the massive transfer of payments that this generation has secured to themselves from future generations? Social Security, Medicare, etc. are justly called entitlements; why is this generation the one in our history that felt entitled to so much in exchange for their service to the nation? Brokaw doesn’t even have greater amounts or greater depth of service on which to base his unreasoned and unreasonable accolades. The brothersjudd author is guilty with those two questions, however, of doing precisely what he accuses the WWII generation of doing to the Baby Boom. The WWII generation was not responsible for staying out of WWII: that was THEIR fathers’ decision. They are guilty of much, but not of that. The brothersjudd website author also notes that the Baby Boom might be the most coddled generation ever to walk the earth, but also asks, who raised them? It is highly likely, however, that the Baby Boom is not nearly as spoiled as the World War II generation would paint them…anymore than Baby Boomer soldiers were as cowardly as they were painted by the World War II generation; just the opposite considering they served more days under worse conditions than any WWII vet did. · Recouping the 40 percent of what little they had managed to save for retirement that was wiped out by the Bush recession. Add to all that the fact that the WWII Generation was the very last one to get defined benefit retirement plans, and it’s a miracle Boomers haven’t once again manned the ramparts and demanded change, as they so effectively did during the Vietnam War. As for Brokaw’s chosen few: Are they the Greatest Generation? Hardly. The term Greediest comes immediately to mind. Read this book by America’s rabbi. Rabbi Ben Kamin explains how we got to where we are, and helps you understand the events of summer, fall and winter of 2008. Thus covering the events leading up to and the election of Barak Obama. With gentle humor and world-class wisdom, Rabbi Kamin explains it all for you. A masterful work of spiritual self-help and a guide to recovery of all we hold dear in these tumultuous times. Out now on Kindle and in print. Catfirmations, a book of druid based affirmations, with many beautiful colour photos of magical Dartmoor, in Devon, England. No self-respecting cat would teach you everything it knows…but our Dartmoor cats offer abundant Catfirmations to help you in your daily life. And there are some gorgeous pictures of cats and magical Dartmoor as well. With Catfirmations, you can access the wisdom of cats when you need it. In this charming little book, by author Laura Harrison McBride and landscape photographer Rachel Burch (who tracked these kitties across the wilds of Dartmoor*), Dartmoor cats offer affirmations to help with virtually all of your life’s major challenges, from health to safety. As a bonus, you get vibrant photos of magical Dartmoor scenes, and a collection of cat photos that would make almost any cat person’s heart sing. Salve your soul, save your sanity and buy this book of on-target affirmations for help in most of life’s little difficulties. *OK. She didn’t find the cats in the places shown. She added them. Like magic. Car Full of Death, is the latest in the Shelf & Chloe Barker, murder mystery series. Lurch through East Anglia, UK, with the most lovable D.I. (Driving Instructor) in history ever to become a P.I. (Private Investigator), and plunk his bum on a stool in Brooklyn, NY, eating Junior’s Cheesecake—real New York cheesecake…. Go with him as he attends a Mafia funeral to rival a royal wedding. And then worry and scold like a Yiddishe mama as he risks life and limb to solve a murder best described as a dripper. Driving instruction? Oh, yes. He does some of that, and his driving students are, well, unusual. Some won’t drive. Some won’t stop. Some kill things along the way to driving competence. Like author Jonathan Gash’s Lovejoy, the antiques-dealer-turned-sleuth, Shelf Barker is an encyclopedia of oddness, but a lot less snarky. But he is non-politically correct–or maybe a better way to say it is omni-ethnic–about it all. So how DOES a mild-mannered Brit go from giving driving lessons to the great British public of terrified driving students to solving a double murder? He has help. Like Janet Evanovich’s almost helpless Stephanie Plum, Shelf works under the watchful eyes of two able helpers. One’s an Italian beauty who can barely boil pasta, and the other is one of his ex-wives whom he fondly compares to a deadly snake. Not exactly Stephanie Plum’s Ranger and Joe Morelli. More interesting. He labours under myriad delusions, Shelf does, not least of which is that as a former university professor (his slide from grace has been bumpy), he knows everything about everything. Including English. When he chides his wife about her mistakes in English, she assures him her university studies taught her proper English. “I always add ‘proper AMERICAN English’,” he replies, “and that always gets me a fine Italian phrase in return, a sneer and sometimes a familiar hand gesture.” She probably learned the gesture from her Mafia forebears. Go figure. Poor Shelf has to grapple with US idioms, suffer through the vagaries of British jurisprudence, and keep his astonishment hidden through an Italian funeral where bodies surf along Brooklyn roads and demented mafiosi retirees give the game away. To top it off, a central African warlord who sounds like Eddie Murphy in Coming to America plays a central role. Barker is not a dab hand at handling a gun, but he can handle concepts just fine. And he has a fan-thing going for Lorena Bobbitt and her shorn husband, John. Remember them? Twenty years ago, Lorena trimmed her husband’s private parts a bit too close. “A fiction writer couldn’t come up with a better name for an egomaniacal American who fancied himself a matinee idol and who was shorn where it hurts—bobbed, you might say—than John Wayne Bobbitt,” Shelf notes. Shelf has fun, he really does. See for yourself. He samples the best New York Cheesecake. He spends some quality time with the local constabulary. He falls in love. Again. And again? Maybe. A book for new riders or parents of young riders, that wish to ride in the English style. How to find the best possible instruction. How to be safe, not sorry. How to have fun. What you REALLY need, and what is optional. When to buy a horse…if ever. What to expect in riding lessons. It’s bad for most of us these days. Low incomes, high expenses, a Congress that seems more like a playpen full of unruly and somewhat stupid children. It’s all George’s fault, right? He did preside over the financial debacle at the end of his unfortunate term. Some think it’s Obama’s fault, but the truth is, he inherited problems too big for one man to fight alone…and he has been, mainly, alone. It is time to put the blame where it belongs, on the single generation that, like an architect drawing plans for a huge building that must not fall, wrote the blueprint for all our problems. Who? The generation Tom Brokaw gorrmlessly glorified as the Greatest. In fact, it was the greediest, from having too many kids with no regard for them or the planet, to ensuring their golden years would glow with a light provided by their children’s and grandchildren’s rising taxes and diminishing paychecks.. Indeed, looked at rationally, it was the so-called Greatest Generation that has made us all A Nation of Serfs. In just nine chapters, A Nation of Serfs explains it all for you. Out now in Kindle and in print at the Muffin Dog Press CreateSpace eStore. Poems of Cornwall and the Atlantic Rim. A book of poems and prose poems occasioned by Cornwall, New York City, Key West and other sea-girt places. Reflections, ruminations and revelations.